The Dewalt DW735 planer is currently the benchmark for portable planers in North America. It has won a number of magazine comparison tests, and the vast majority of owners on the woodworking forums are very pleased with it. 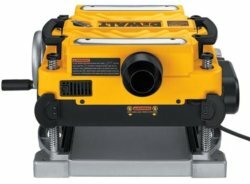 However, this Dewalt wood planer gets mixed reviews and not-so-great average ratings on some retailer's websites, due to earlier issues. Part of the reason is that there was a reliability issue when this model first came out in 2003. The issue was fixed in late 2004, but those old review posts are still out there. There also has been a more widespread issue with short blade life that was apparently resolved around 2009-2010, and that complaint really brings the ratings down on some of the retailer sites. The best evidence that the issues have been fixed is the much-higher average ratings on the package deal (DW735X) that came out in 2010. The DW735X (see below) is the same machine, but comes with extra blades and the infeed/outfeed supports. The Dewalt DW735 is a 13" benchtop planer with a depth capacity of 6" and a 1/8" max cut depth. It has a 15 amp motor that provides a 10,000 RPM cutterhead speed. There is a two-speed transmission which provides either 96 or 179 cuts per inch from the three-knife cutterhead. The knives are dual-edged so they can be flipped over when the first edge gets dull. The Dewalt 735 has a sturdy four-post design with an automatic carriage lock, and fan-assisted chip ejection. At 92 lbs, it is one of the heavier portable planers available, which is both a blessing and a curse. The weight adds to the stability and durability of the machine, but makes it more difficult to lug around. It does have nice thick handles though that make it more comfortable to carry than some other benchtop planers. In two separate comparison tests by two different editors, Fine Woodworking Magazine rated the Dewalt DW735 the "Best Overall" portable planer in the 2009 and 2010 Tool Guide. WOOD Magazine named it the Editor's Choice Top Tool in their review of nine different benchtop planers in November 2006, and again in a 2010 test of eleven different planers. 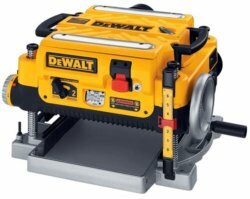 Tools of the Trade Online said the Dewalt wood planer was the best machine in their 2007 review of seven benchtop planers. Amazon: 3.5 out of 5 stars, 191 reviews (click to see) , would be slightly better if you throw out the bogus non-owner posts, shipping damage complaints, etc. - I've had my Dewalt DW735 for a few years now, and it works great for me. I did add the infeed and outfeed tables to eliminate the snipe it had. - John S.
- I have used this planer for over 2 years and love it. I find the thickness is consistent with any setting, and feeding multiple boards through will yield boards with very close tolerances. I find the finish to be very good. I haven't even flipped my blades over yet and have done close to 5,000 linear feet through the Dewalt 735. - R.O. - I have a 735 and am happy with it. I had an older Delta before the Dewalt 735 and had problems with snipe. The first set of blades on the Dewalt planer didn't last but the replacement set has done well so far. 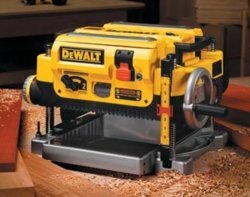 - Mike H.
- I have been using the Dewalt 735 planer for a year now with no problems. The knives are still sharp, and with the extensions I rarely get any snipe. Overall a very good buy. - Tom R.
- I have a Dewalt DW735. Great planer, no complaints, it does an incredible job of giving you a smooth surface if you buy the optional infeed/outfeed tables. - Tim M.
- I've used my Dewalt 735 planer for a while now and really like it. I agree with the other owners about the absolute necessity of the infeed-outfeed tables. With those in place, snipe is easily managed. - Dave R.
- I've had mine 3 years, and love it. Plenty power and knife changes are very easy. - Bill H.
- I have a 735 that I am very satisfied with. I added a Shelix cutterhead a few months back, and the noise issue has been drastically improved. I would highly recommend the Dewalt 735 planer to anyone who doesn't have room for a stationary machine. - Travis B. - As for blade life, I just reversed mine for the first time after about three years of using it on weekends. I don't take much off on each pass, which might explain the long blade life. - K. W.
As you can see, the majority of owners are quite happy with the Dewalt DW735 . If you read all of the comments above, you probably noticed several posts about blade life. That has been somewhat of an Achilles heel for this Dewalt benchtop planer. Although many users report satisfactory or better-than-average blade life, there are a large number of reports that the blades nick very easily and/or become dull quickly. It obviously has been a real (not imagined) issue, but the issue is not common to all of the machines, as you can see in the comments above. I saw a several comments online that the current blades have been revised and now last longer. A number of folks got free replacements from the company by calling and complaining, and some said the new blades lasted much longer. Some folks have had better luck with aftermarket replacements. But the complaints are still out there in the Dewalt DW735 review posts, lowering the user ratings. Short blade life is the main reason for the low-ish rating on the Amazon, Dewalt and Lowes websites. The replacement blades are also more expensive than they are for some other planers. Another complaint I saw several times is that the Dewalt 735 is quite loud, although that sort of comes with the territory. All benchtop planers will require hearing protection for the user, but some of them won't annoy your neighbors quite as much! A small number of owners found that the rollers need more frequent cleaning than other planers they have used, and a few owners had issues with the blade screws seizing and stripping out (a complaint I have seen with other brands also). There is one report that the blade screw issue was corrected in mid-2009. You also may have noticed in the comments above that infeed and outfeed tables are an important factor in reducing snipe. The Dewalt DW735 does not come with the tables, but they are available separately. 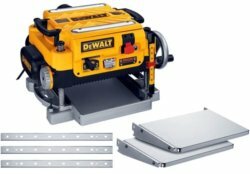 Of course, if you want the tables, now you can just buy the Dewalt DW735X. The DW735X is the same planer, but it comes with the infeed and outfeed tables and an extra set of dual-edged blades. There are still some reports of snipe, but most everyone agrees that the extensions make a big difference. Out of 17 review entries, there is still one owner that isn't happy with the blade life, but he admits he is planing knotty lumber. All in all, most owners are very happy with the Dewalt DW735 and DW735X. The potential issue with the original Dewalt blade life appears to have been resolved, and now there are aftermarket blades available that are reported to last 2-3 times longer than the Dewalt blades. There are a number of owners that like the Dewalt DW735 enough that they have invested several hundred dollars in a spiral cutterhead, which eliminates the potential blade life issue altogether. Time and time again, both owners and magazine editors praise the quality of the Dewalt's finish, and report that the Dewalt DW735 planer leaves less snipe than other portable planers. It is solidly built, reliable, and provides accurate cuts. The features, minimized snipe, and smoothness of the finish it leaves put the Dewalt DW735 at the top of the portable planer class. To get all the detailed specs on the Dewalt planers, visit Dewalt's website. However, if you just don't like the color yellow or are looking for another model to compare the Dewalt DW735 to, the Delta 22-590 and the Makita 2012NB are very similar in price and quality.